News that the U.K. voted to leave the European Union sent a shockwave through the markets, which reacted—as markets do—to the unanticipated with a sharp selloff from the Nikkei to the FTSE 100, with the U.S. markets opening sharply lower [down about 3% at the time of this post]. Given that polls had predicted the U.K. would remain in the E.U., continuing its 43-year association, the event disappointed the market, which had rallied earlier on prospects of the union remaining intact. Of note, the S&P finished last week at the 2050 level and 30 days before that at about the 2050 level and ironically finished the first quarter of 2016, you guessed it, around 2050. With the rally earlier this week into the vote being evaporated, it will be interesting to see what price the S&P closes at for this week and this month and quarter end. As historically or politically significant this event is, even with the U.K. Prime Minister David Cameron resigning, it is still an “event.” Unless this event leads to some change in economic fundamentals in the U.S., the long-term outlook remains positive for U.S. equities. Investing based on events is challenging, requiring a good deal of luck. Several studies put event-investing into context by explaining correctly that events typically trigger a rush for protection. Investors sell risk assets like stocks and buy low risk or no risk assets like cash or Government bonds. Our research has shown that markets tend to recover from “events” if economic fundamentals are solid. Furthermore, to the extent that uncertainty is the main cause of U.S. stock losses, we believe that factor will dissipate over time. As of today, our read on the economy based on our proprietary Astor Economic Index® (“AEI”) still supports a meaningful weighting in U.S. stocks. To be clear, if economic fundamentals were below long-term and shorter-term trends, risk assets would have a challenging time recovering. But if that were the case, we would in all likelihood have already decreased our exposure to stocks based on those economic fundamentals, even before the event occurred. Our read on the U.S. economy has been pointing to a minor slowing over the past several months and we have made minor reductions in equity exposure accordingly. It’s important to understand that lower AEI readings are not necessarily an indication of recessions or bear market if the reading is still above the long term average tend. We make adjustments as we attempt to manage risk/reward outcomes not market time short term moves. But as of this writing we still hold meaningful weighting to stock indices. Meanwhile, our fixed income holdings and low-risk, non-correlated assets appear to be accretive to the portfolios, helping to mitigate risk and offsetting drawdowns on the equity side. We consider it unlikely for the Brexit news to trigger substantial reductions in equity exposure—unless economic fundamentals deteriorate below multiyear levels. If that were to occur, we could get very defensive and even take inverse positions. That said, we’ll be closely watching the economic trends. For example, if the U.S. dollar’s strength carries forward into another significant broad rise, that would likely put renewed pressure on the U.S. manufacturing sector. But if we try to drill down on what changes in the E.U. mean to trade and export data, along with capital flow expectations, it is too soon to make a forecast about long-term implications. After all it will take years to implement Britain’s exit from the EU and a lot can happen before that. What we do know is uncertainty creates volatility, which we’re certainly seeing in the markets. But it’s hard to connect the dots from shock over the Brexit vote to a recession or bear market. 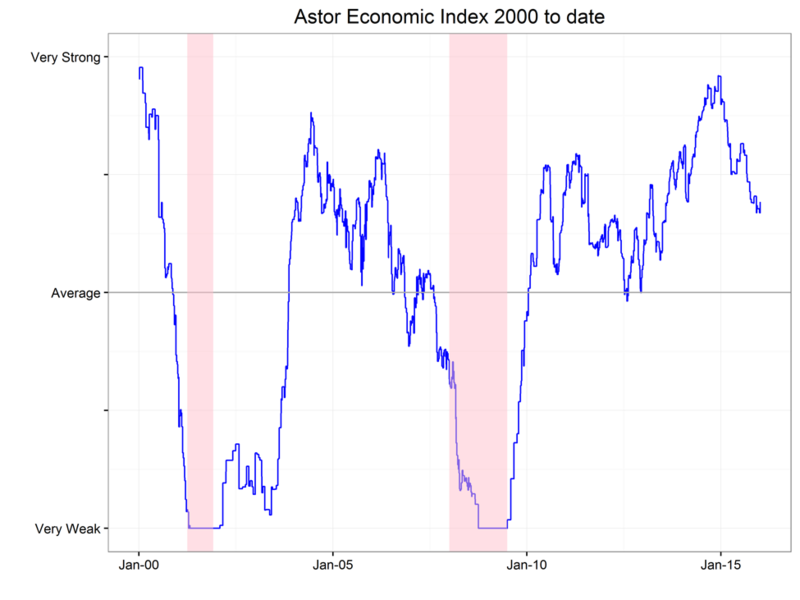 We are comfortable with the current portfolio and have high confidence in our robust “now-cast” tools such as the AEI. The gradual reduction in risk exposure over the past several months has helped the portfolio achieve desired results. And, if the economy picks up as is expected later this year, we would re-examine increasing beta.